A canvas printed thangka of Vajrapani, the Buddha of Spiritual Power. Vajrapani will be the last of the Buddhas to appear in this fortunate eon, therefore keeping his image and making a connection to him will be of great benefit to us. A canvas printed thangka of Vajrapani, the Buddha of spiritual power. 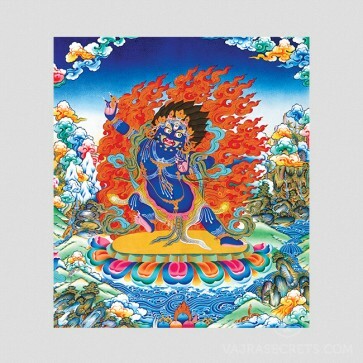 Vajrapani is an emanation of Buddha Akshobya and he represents the power and skillful means of all the Buddhas. His outstretched right hand brandishes a vajra and his left hand holds a lasso with which he binds demons. He wears a skull crown with his hair standing on end. His expression is wrathful and he has a third eye. Around his neck is a serpent necklace and his loincloth is made up of the skin of a tiger, whose head can be seen on his right knee. For the practitioner, Vajrapani is a means of accomplishing fierce determination and symbolizes unrelenting effectiveness in the conquest of negativity. During Buddha Shakyamuni's time, it was he who requested the Buddha to teach many of the Tantras that are practiced today. Vajrapani will be the last of the Buddhas to appear in this fortunate eon, therefore keeping his image and making a connection to him will be of great benefit to us.